(Nanowerk News) Elkem Solar, a Norwegian producer of solar-grade silicon, has combined basic and applied research to develop production methods that cut costs and consume less energy than conventional silicon production. The Kristiansand-based company has now accomplished its three primary objectives. Silicon production costs have been significantly reduced compared to conventional production. Energy consumption has been cut dramatically. All the while, its efficient methods preserve the power output of silicon-based solar cells manufactured at its facilities, compared to silicon solar cells produced by traditional means. 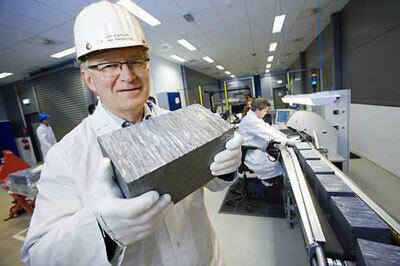 Traditional production of silicon involves first gasifying the raw material, a costly and energy-intensive method. Elkem’s method is based on traditional metallurgy; the raw material is melted and then undergoes several processing stages to prepare 10-kg silicon blocks for sale to solar cell producers. This method makes production more cost-effective and energy-efficient and is suitable for large-quantity production. Dr Tronstad believes strongly that the international solar cell industry will continue to grow, and that all the silicon that is produced will be sold. Elkem makes the most of a combination of types of project funding from the Research Council. The company has received funding for innovation projects under the Programme for User-driven Research-based Innovation (BIA) – the Research Council’s open competitive arena for such projects – as well as funding for basic competence development through Knowledge-building Projects with User Involvement (KMB) under the RENERGI programme. Elkem is also a partner in the Norwegian Research Centre for Solar Cell Technology, one of Norway’s eight Centres for Environment-friendly Energy Research (FMEs). User-driven Innovation Projects (BIP) represent one of the Research Council’s most important funding instruments for promoting industrial research and innovation. Industry players themselves are responsible for deciding what is to be studied, and research activities must clearly reflect the company’s own strategic targets. Knowledge-building Projects with User Involvement (KMB) are designed to promote the development of research groups in order to boost the international competitiveness of Norwegian trade and industry. This is a key funding instrument for enhancing the ability of Norwegian private enterprise to face competition in the global market.